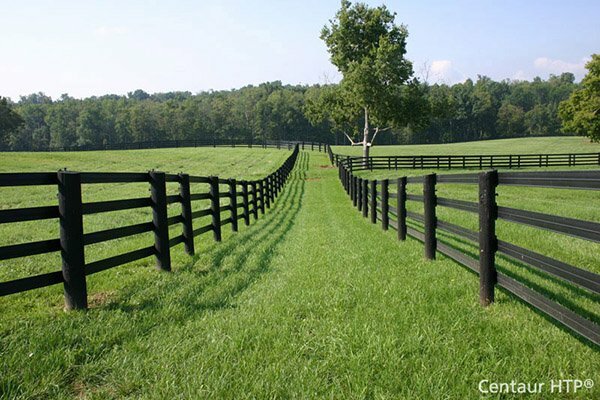 Bufftech Danbury Vinyl Fence Sections - Concave Top | Hoover Fence Co. The Danbury Concave style is a thru-picket design that looks the same from both sides. Truly a "good neighbor" fence. Traditional design is available in 4' high white, almond, and clay. Has steel reinforced bottom rail for added strength. Concealed fastening system means no unsightly nails or screws. Crimped pickets drop through rails and lock into place for easy assembly. Pickets measure 7" difference between longest and shortest picket. Sections include rails and pickets w/caps. Sections are capable of raking out of square slightly to follow grades. Posts and post caps sold separately. 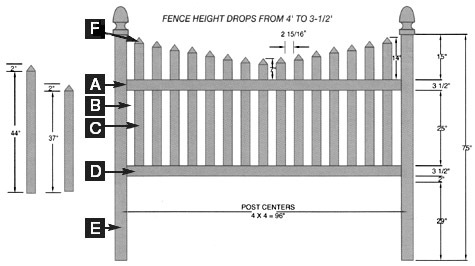 Top Rail (A): 2" x 4" x 95-1/2"
Picket Spacing (B): 16 spaces of 2-15/16"
Post (in-ground) (E): 4" x 4" x 75"
Post Spacing (center to center): 96"